Albert B. Sabin was born in Bialystok, Poland, which at the time was part of Imperial Russia. His family immigrated to the United States in 1921 to avoid Nazi persecution and settled in Paterson, N.J.
Sabin originally planned to study dentistry because his dentist uncle had offered to pay his college tuition at New York University (NYU) if he pursued the profession. He became interested in medical research, however, and changed course, earning an M.D. from NYU in 1931. That summer, New York experienced a polio epidemic, and Sabin developed an interest in studying polio and other infectious diseases. Sabin joined the research staff of the Rockefeller Institute for Medical Research (now Rockefeller University) in 1935, and moved to the Children's Hospital Research Foundation at the University of Cincinnati (UC) four years later. During World War II, Sabin traveled the world studying viral diseases as a lieutenant colonel in the Medical Corps. His accomplishments included the development of vaccines against dengue fever and Japanese B encephalitis. After the war, Sabin returned to his position at the University of Cincinnati, where he remained for 30 years. 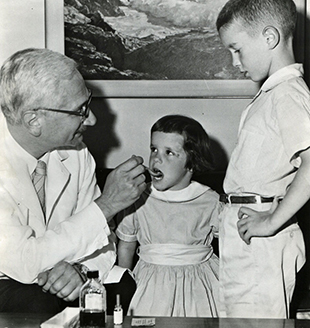 In the mid-1950s, physicians were administering a new killed virus polio vaccine developed by Jonas Salk, which prevented many of the complications of polio but required booster shots. Meanwhile, Sabin’s research at the UC revealed that polio viruses live not just in the nervous tissues but in the small intestines as well, a discovery that suggested polio might be prevented with an oral, live virus vaccine. Sabin and his research associates developed an oral vaccine, which they first ingested themselves, then tested abroad so as not to inadvertently include subjects who had already received the Salk vaccine. The first large-scale use in the U.S. was in 1960, when it was administered to 180,000 schoolchildren in Cincinnati. The Sabin vaccine, which successfully prevented the intestinal infection and provided lifetime protection, ultimately replaced the Salk vaccine as the United States’ primary defense against polio. After leaving the U.C. in 1969, Sabin spent several years as president of the Weizmann Institute of Science in Israel, then returned to the U.S. and joined the faculty at the Medical University of South Carolina. He later served as a scholar and advisor at the Fogarty International Center for Advanced Studies in the Health Sciences of the National Institutes of Health. Much of his work in the latter part of his career focused on the relationship between viruses and human cancer. In the last decade of his life, Sabin suffered from a disorder that led to paralysis. Though the condition was treated by surgery when Sabin was 86, he died the following year in 1993 of congestive heart failure.